Implantologist, Periodontist, Prosto-dentist, Orthodontist, Pedodentist, Endodontist. At Helvetic Clinics, each dentist is a specialist in his own field. Each team member plays an important role. Drs. Peter and Laszlo LUKACS manage our pain free dental clinic in Budapest. Your dentist has had several years of specialized training that help him understand your dental health. Only dentists are able to examine your teeth, gum and mouth, and diagnose problems that can affect your overall health. Undertake urgent or necessary procedures – and help you determine a long-term treatment. Our dental hygienists are licensed dental professional. They are trained and educated to focus on cleaning your teeth, polish them and apply fluoride. They may also processes teeth whitening procedures. A very important member of the dental team, the dental assistant prepares you to receive your treatments, sterilizes the instruments, assists your dentist and helps to keep your mouth dry during procedures. The patient coordinator is your primary contact in the clinic. He welcomes you upon arrival, helps you fill in the medical questionnaire if needed, takes you to the X-ray, stays with you during your consultation, ensures the translation between you and your dentist if needed (our doctors and all the team speak English), presents you your treatment plan and answers all the questions you may have. The lab technician will produce all of the dentures, prosthetics, crowns that the dentist will need to rehabilitate your mouth. Receptionists establish the schedule of the team and see that all the clinic’s operations are going well. The receptionist is usually the first person to whom you talk, and often gives you general information about your appointments and billing. 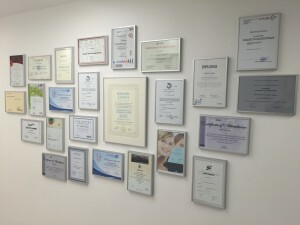 * All our dentists are members of the Hungarian chamber of dentistry, proof is available upon request in the clinic.